To remove grout haze from natural stone & acid sensitive surfaces. MicroScrub is a safe yet powerful biodegradable nano cream cleaner that is non-flammable, non-toxic and contains NO VOC’s (Volatile Organic Compounds) or acids. 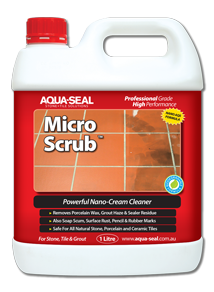 Utilising the latest Nano-AQS technology, MicroScrub will effectively remove most factory applied porcelain wax, floor finishes, light grout haze residue (including light epoxy grout haze), surface pencil marks, rust, mineral deposits and sealer residue. Can also be used to boost the performance of any cleaner or problem solver. Ideal to safely abrade away dirt & grime from heavily textured, hard to clean surfaces. Will not affect any penetrating type sealer. USE: On all natural stone, grout, ceramic, porcelain, terracotta, Saltillo, quarry tiles, terrazzo, concrete, pavers & masonry surfaces. Note A: Use Haze Away or OxiTreat to remove grout haze from porcelain or ceramic tiles.